Please note that I’m in no way trying to downplay the tragedy of 6 years ago by not writing about it. I wish we could take a vacation. It’s not in the budget this year. I’m not actually very optimistic about it being in the budget any time soon. I’m in school part time, work full time, we’re in debt (bad), blah, blah, blah. We’ve only really been on vacation together once–that was our honeymoon. Granted that was only a little over a year ago, but I don’t think it counts. Honeymoon doesn’t count as VACATION. It’s a honeymoon. Plus, we didn’t go right after our wedding, we went a month later after a work trip we went on. So, unwinding after a 4-day melee of corporate reward maintenance, AND pinching pennies on our very first “just us” trip as a married couple. Our first “just us” trip, period. I won’t outline the whole trip tonight. I’m tired–I worked for 8 hours, went to math class, went to the grocery store to get water and post-surgery craving suppressors for the hubby, came home, fixed dinner (doesn’t really count but I stressed about it longer than it took to heat up the White Castle burgers–more on this in another blog–maybe. Have you ever read the non-microwave instructions on those things? I don’t even OWN a broiler pan. I microwaved the little bastards. ), and then worked on a work project for 2 1/2 hours. All this made me yearn for vacation, so I thought of the only one I’ve had in a LONG time. 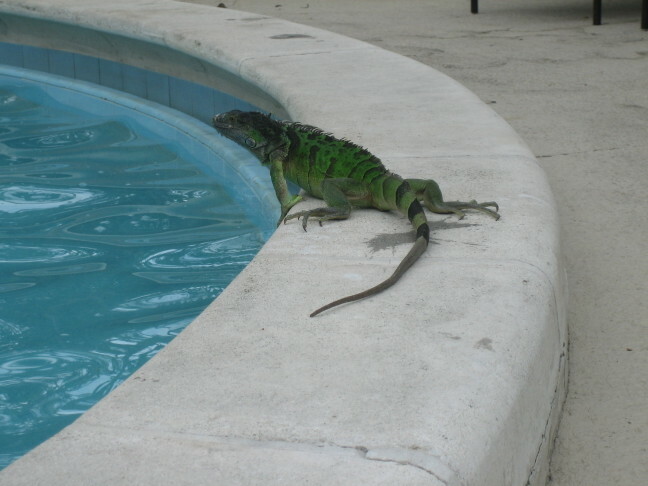 At the hotel in Key Largo, there was a large iguana who made a daily appearance by the pool. He’d climb out of the foliage, take a dump and a pee on the side of the pool, swim across the pool, and climb back into the foliage on the other side. Ahh–Florida. The bartender told us that iguanas are not native to Florida. Someone brought them there and they’ve thrived. Like frogs on Family Guy. This entry was posted in TV and tagged Honeymoon, Marriage. Bookmark the permalink.